The realization of a dream left Zeke Herrmann a bit speechless Tuesday morning. 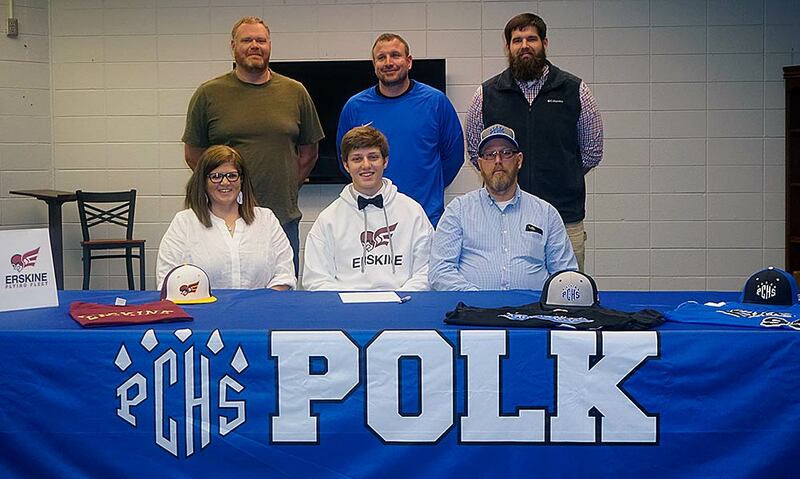 The opportunity he’d worked for since he began playing T-ball at the age of four was at hand, and with a single stroke of a pen, Herrmann made his goal to play college baseball a reality, signing a national letter-of-intent to continue his career at Erskine College. Moments after completing the signing before an audience of family and friends in Polk County High School’s media center, Herrmann still found having the moment actually at hand hard to believe. Herrmann moved to Polk County prior to his senior season, having begun his high school career at Chase. His ties to Rutherford County include his travel team and his pitching coach, former major leaguer Todd Coffey, who also attended Tuesday’s ceremony. Coffey, who played for four teams in his eight-year Major League Baseball career, has worked with Herrmann for the past year and thinks he could prove a valuable signee for Erskine. “He’s big and consistent, and he has a very good work ethic,” Coffey said. “He’ll work hard and improve each time he’s out. Located in Due West, S.C., Erskine is a Division II program that competes in the Conference Carolinas. The Flying Fleet finished 26-25 in 2018 and begin 2019 under the direction of first-year head coach Mark Crocco. “i started talking to them last summer, when I went to a workout,” Herrmann said. “Since then we’ve been talking. I went on a visit and liked it there, and ever since then I’ve been thinking about going there. Herrmann hopes to spend three seasons at Erskine, then move to Clemson for two years to complete a degree in engineering. “I’m going to keep grinding and work as hard as I can,” Herrmann said.